Betty Olivero has written a solemn, moving choral piece for SATB chorus and soloists, clarinet, accordion, piano and harp using a compilation of psalm verses of supplication. The title, Lo Ira Ra is taken from Psalm 23 and is translated “I Will Fear No Evil.” Each voice in this composition speaks in dialogue with the others in the style of Middle Eastern heterophony. There is essentially one melody that is played and sung differently by each voice in the composition, each voice inspired in part from the music rising from the swarming population of Jerusalem. The Psalms themselves are shared by a number of religions and in this piece the text and music reflect the reality of the music that is already shared. 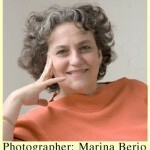 Betty Olivero is a contemporary Israeli composer, who has lived during most of her career in Florence,Italy. In Olivero’s works, traditional and ethnic music materials are processed using western contemporary compositional techniques; traditional melodies and texts undergo processes of development, adaptation, transformation, assimilation, resetting and re-composition, to the point of assuming new forms in different contexts. These processes touch on wide and complex areas of contrast, such as east and west, holy and secular, traditional and new. Olivero was awarded the Fromm Award by the Fromm Music Foundation (USA, 1986), the Prime Minister’s Prize (Israel, 2001 and 2009), the Rosenblum Award for the Performing Arts (Israel, 2003), the Landau Award for the Performing Arts (Israel, 2004), the ACUM prize for Life Achievements (Israel, 2004), and the ACUM Award for Achievement of the Year (Israel, 2010). In 2000, Olivero was awarded the prestigious Koussevitzky Award by the Koussevitzky Music Foundation and the Library of Congress.